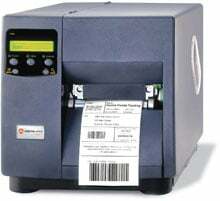 Datamax-O'Neil I-4208 - Thermal transfer printing, 203 dpi, 4" print width, Parallel and Serial Interfaces, and Rewinder. Includes US power cord. Order cables separately. Superior price and value make the I-4208 the premier 4" printer in the world. The I-4208 printer is available in either direct thermal and thermal transfer configurations, The I-4208 is capable of producing a 203 dpi, four-inch wide image at 8 ips, and supports all popular linear and two-dimensional barcode symbologies. Built to meet the toughest printing requirements, the I-4208 incorporates many standard features normally found as options on competitive products. All units ship with product documentation. Media Sensor: Adjustable sensor detects "see through" for liner-backed die-cut labels and tags or reflective sensing for media with black stripe sensing. 3" x 1182' Black Wax-Resin Ribbon, Compatible with Industrial printers and Polypropylene Labels, rolls/case: 24, Core Size: 1". 4.25" x 1182' Black Wax Ribbon. Compatible with Industrial Printers. 24 ribbon case. Used with paper labels. Also available as a single roll (Part# 222119-R). 4.25" x 1182' Black Resin Ribbon. Compatible with Industrial Printers. 24 ribbon case. Used with polyester labels. Also available as a single roll (Part# 221942-R). The Datamax-O'Neil R42-00-18400007 is also known as DMX-I4208R	or R420018400007	.